In 1955 an official central journal “Problems of Philosophy” №4 published the USSR first article on cybernetics, authored by S.L. Sobolev, A.I. Kitov and A.A. Lyapunov, initiating with it a broad and lasting public discussion, which eventually expanded to –literally – the size of the country itself. The authors provided deep and thorough analysis demonstrating essence of the cybernetics and its meaning for contemporary scientific development. However, one shouldn’t forget that the cybernetics was severely criticised from the positions of official philosophy and ideology and those attacks had noticeable number of supporters. Anyway, the article had invaluable importance for better presenting – respectively, understanding – the very fundamentals of new science. It wouldn’t be an exaggeration to say, that it made decisive impact on the academic public, which obtained a firm ground of new science, stimulating the people to change and update their scholarly mentality. In their article the authors considered general scientific meaning of the cybernetics as emerging theory of information science, as well as the theory of electronic computing machines and systems of automatic control. That was really the scientific event of great value. vAnatoliy Ivanovich Kitov – one of the three authors, was a pioneer in development and promotion of digital electronic computers theory and their practical implementation in various fields of human activity. His book “Digital Electronic Machines”, published in 1956 by the “Soviet Radio”1, was the first systematised course for a broad circle of students and specialists who began mastering electronic computers, computing and their practical applications. The book actually caused an overturn in attitudes of many researchers since it had been written simply and easily, clearly presenting comprehensive amount of well systematised material *. We all should be grateful to A.I. Kitov for daring generalisation of numerous results and their systematic narration. At that time several scientific centres were already developing digital electronic computers. Most important work was conducted at the Institute of Precise Mechanics and Computer Engineering in Moscow, which was headed by academician M.A. Lavrentev. Sergey Alexeevich Lebedev was the leading designer of electronic computers at the institute. Lebedev headed in his turn a team of numerous scientists and engineers. Intensive researches were also conducted at the Institute of Applied Mathematics (USSR Academy of Sciences) under scientific guidance of Prof. M.R. Shura-Bura and at the computer centre of the USSR Academy of Sciences by A.A. Dorodnitsin and his collaborators. Serious research was also performed by A.A. Lyapunov, A.P. Ershov and other famous mathematicians. Results of all those numerous researches were generalised and systematised in the USSR first ever openly published monograph on computers and computations, written by A.I. Kitov. The first book by A.I. Kitov was followed by his other book written jointly with N.A. Krinitskiy, “Electronic Digital Computers and Programming”, published by the State Publishing House of physical and mathematical literature. That was a perfectly composed educational course-book. USSR Ministry of Higher Education approved its publication for usage at technical universities. At that time it was practically an encyclopaedia of computer science. This wonderful work helped many generations of the soviet students to receive fundamental education and become prominent scientists or experts in various fields of knowledge. These books, written at the beginning of the computer era in our country should not be forgotten. Now thousands of our scientists are grateful to remember the great, heroic contribution of Lebedev, Mel’nikov, Burtsev, Ershov, Shura-Bura and their followers to development of electronic computers and their applications. And all of it had started with the scientific pioneer activity of Anatoliy Kitov. The works of our outstanding scientist Anatoliy Ivanovich Kitov, which appeared in the early 1950-s and later, were organically integrated in our computer progress and played equally essential role in it. * The 300 pages book by A.I. Kitov, “Digital Electronic Computers” (1956). This was the USSR first book on programming. Later it was translated into several foreign languages. Both the title and contents of its closing part - “Non-arithmetical Applications of Computer” display broad range of subject-fields where computers either were already used in 1956, or at least their practical implementation was seriously considered. Those were economy, automation of industrial processes, artificial intellect problems, etc. 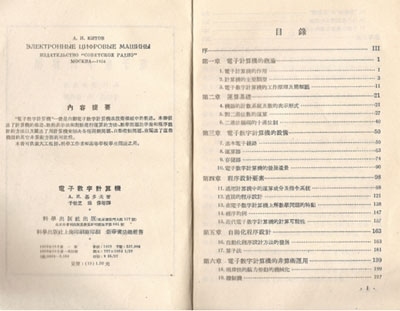 The book became the source, from which many famous Soviet scientists received their first information about computers and possibilities of their application in industrial processes automated control and solving of economy problems. They were M.V. Keldysh, V.M. Glushkov, G.I. Marchuk, V.S. Michalevich, N.M. Amosov, A.I. Berg, L.V. Kantorovich, N.P. Buslenko, I.Ya. Akushskiy, G.S. Pospelov, V.A. Trapeznikov, I.N. Kovalenko, O.B. Lupanov, V.S. Nemchinov, P.E. Elyasberg, N.P. Fedorenko, V.S. Korolyuk, N.A. Kuznetsov, S.V. Yablonskiy, I.V. Sergienko, O.I. Aven, A.A. Stogniy, etc. American scientist J.W. Carr mentioned this book in his monograph “Lectures on Programming” (University of Michigan, 1958), writing, “Probably the most comprehensive description of the computer programming problems, illustrated with detailed analysed examples of both manual and automatic programming, is available at present in the book by A.Kitov. Some parts of it have been translated into English so they are available at the American Computer Association”. The Russian translation of the book was published in the USSR in 1963. J.W. Carr himself visited USSR, what was described in “A visit to computation centers in the Soviet Union” (John W. Carr, III, Alan J. Perlis, James E. Robertson, Norman R. Scott, June 1959, Communications of the ACM , Volume 2 Issue 6). J.W. Carr, “Lectures on Programming”, 'Foreign Literature' publishers, Moscow 1963. The interest of american researchers, famous for their quick reaction to promising scientific novelties wherever they appear, to Kitov's work after the analysis of good 150 main sources on computers and programming, personally performed by J.W. Carr, could be a sufficient proof of its high value. So, in the 1950s, it was really one of the best books dedicated to computers and programming. The very first publication on computers printed in the USSR was A.I. Kitov's 40 pages article “Applications of Electronic Computing Machines” presented by the journal “Proceedings of the F.E. Dzerzhinskiy Artillery Academy” in 1953. About the author: Academician Guriy Ivanovich Marchuk. Chairman of the Siberian department of the USSR Academy of Sciences, before 1980, Chairman of the USSR Committee on Science and Technology from 1980 till 1986, simultaneously the Vice-Chairman of the USSR Council of Ministers; President of the USSR Academy of Sciences from 1986 till 1991. 1. One of the USSR central publishing houses oriented on technical issues (radio and electronics).